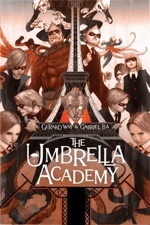 Rawson Thurber, the writer/director of 2004's Dodgeball: A True Underdog Story, has been brought aboard the planned adaptation of Dark Horse Comics' The Umbrella Academy, reports Deadline. Created by Gerard Way (best known for being the lead singer of My Chemical Romance), the 2007 miniseries tells the story of a disbanded superhero family who all come back together after the death of their father. Thurber, who most recently adapted the Michael Chabon novel The Mysteries of Pittsburgh, is also one of the writers of the upcoming Brett Ratner film Tower Heist. He'll take on a script for Umbrella Academy from Mark Bomback (Unstoppable, Live Free or Die Hard).